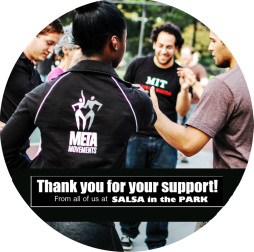 Thank you for visiting MetaMovements' Salsa In The Park website! Every summer we bring together thousands of people of all ages and abilities for a free and popular outdoor summer event series that includes social dancing, performances, dance lessons and training programs, theatre and performance workshops, latin dance proraming for elders of the community and a comprehensive youth employment program. Learn more about Salsa In The Park by clicking on our "about" page and let us know if you have any questions. 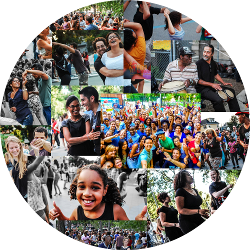 CURRENT EVENTS: Let's keep the spirit of Salsa In The Park alive all year round! 2019 Faneuil Hall Winter Dance Series! Join MetaMovements and Faneuil Hall Marketplace for a MetaMoves Latin Dance Party and lessons featuring DJ Rob Suave playing the best in Salsa, Timba, Bachata, Dembow and more! Become a 2019 Salsa In The Park Donor, Sponsor and/or Vendor! Reach thousands of people this summer by advertising through and at Salsa In The Park or having a resource/promotional table at our weekly events! For more information visit our Sponsor & Donate page! SUPPORT 2019 Salsa in the Park programming (weekly outdoor parties, free dance and percussion classes for children, youth and elders, etc.) by encouraging your friends to donate and help connect us with those who may lead to a sponsorship! To safely donate online by clicking here, we also accept checks, and cash! Donate Today! Contact us for more information! Stay up to date with all Salsa happenings in Massachusetts at www.BostonSalsaCentral.com!